Just like the ink that goes into 2D printers, the plastic filament used by 3D printers is expensive. And it’s bound to get more expensive as manufacturers begin adopting proprietary filament cartridges that limit users’ options. Instead of paying $30 to $50 for 2.2 pounds of plastic, an emerging option is to recycle plastic from used packaging and other household items. For a few hundred dollars, you can buy or make a recycling machine small enough to fit on your desk. A study conducted by Michigan Technological University found that it is really good for the environment too. Researchers tracked how much energy went into recycling a plastic milk jug and found that people reusing them for home 3D printing consumed less energy than sending them to a traditional recycling plant. Energy savings were relatively minor in cities, where home recycling used just 3 percent less energy. But in smaller cities, where plastic has to be trucked further distances to reach recycling centers, the amount saved grew to 70 to 80 percent. The centrifuge printed by the team. The research team also experimented with turning a milk jug into filament. Milk jugs are made from high-density polyethelyne which, while usable in a 3D printer, is much less popular than ABS and PLA. The team printed a centrifuge and found that the plastic shrunk slightly, which makes it not an entirely perfect material with which to print. Study lead Joshua Pearce noted it’s not a big deal if you’re making an object that doesn’t need to be perfect. HDPE isn’t going to replace PLA or ABS as the printing material of choice anytime soon. 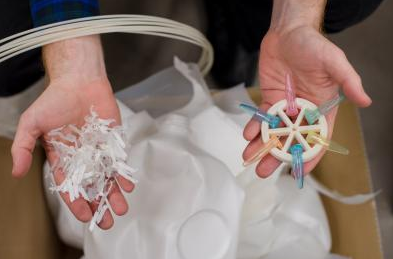 But for those interested in taking a greener approach to 3D printing, it offers a rich source of plastic that doesn’t require people to look any further than their own recycling bin. What an intuitive idea. I do know that recycling plastic still uses energy, because the plastic must be shredded, cleaned, melted and remolded, but it usually requires less energy than making fresh plastic. Fantastic. This is what I’ve been waiting for, a solution to all the plastic in the landfill. Imagine little robots trolling though the dump, finding pieces of plastic to use, shrinking our footprint. Brings a tear to my eye.